What is Kt Kingtronics Diode Bridge Rectifier ? Kingtronics diode bridge rectifier is a device for converting AC, or alternating current electricity into DC, or direct current. AC electricity goes from positive to negative constantly, whereas DC always flows in the same direction. AC electricity is more efficient to transmit and easier to convert into different voltages, so power is transmitted from the station to your house as AC. However, most appliances need DC current to run. A diode bridge rectifier is the most common type of power supply used to provide this current. 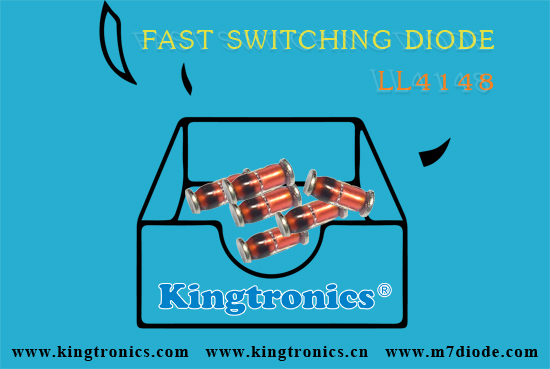 Kingtronics diode include: M7, 1N4001S-1N4007S, 1N4001-1N4007, 1N5391-1N5399, RL201-RL207, 1N5400-1N5408, 6A05-6A10, FR101-FR107, 1N4933-1N4937, FR151-FR157, FR201-FR207, 1N5817-1N5819, 1N5820-1N5822, LL4148, BZV55C & ZMM55C, RS1M, SM4007 melf, UF4007,1N4727A-1N4761A, BZX55C, 1N4148, 1N4148W, 1N4148WS, 1N4148WT. Do you buy capacitors? kingtronics internationl company can offer you excellent radial multilayer ceramic capacitors, Axial MLCC ceramic capacitors and dipped tantalum capacitors. We are ISO 9001:2008 manufacturer, our radial mlcc, axial MLCC, quality is very stable, we have mature technology and good service, normally delivery is 4 weeks around and sometimes can be even faster. Also Dipped tantalum capacitor meets & exceeds the requirements of IEC Spec 384-15-3, IECQ Spec QC300201/US003 & SJ/T10856-96, can be used in military applications. You will find our cross guide for radial multilayer ceramic and axial lead multilayer ceramic capacitors, and all specifications. May I share with you this market information, I found these bridge rectifier have big demand, MB10S, MB5S, DB107S, DB105S, KBL406, KBPC3502. These are very popular. Do you have any inquiry for bridge rectifier, our prices are very good, lead time is 3-5 weeks. And more important, we are ISO manufacturer, and we have UL certifications for bridge rectifier. Could you please tell me the purchasing contact for bridge rectifier? Look forward to your inquiry!! ISO 9001: 2008 manufacturer, UL certification, SGS certification available. A bridge rectifier is a tool used to rework alternating present (AC) into direct current (DC). Moreover, a bridge rectifier is utilized in model railroads to supply the correct direct current to run the motors and other accessories. Placed within the decoder, the bridge rectifier has many functions. *Kingtronics Kt bridge rectifier present many N-channels which suggests that the facility inputs and the detrimental output of the rectifier are well connected. * Kingtronics Kt bridge rectifier present a multiplicity of P-channel which implies that there’s a connection between each energy inputs and the output of the rectifier. * Kingtronics Kt bridge rectifier facilitate third quadrant operation gate voltage management which implies that for mentioned multiplicity of stated N-channel MOSFET means and stated multiplicity of mentioned P-channel signifies that includes at the very least a component to assure fast MOSFET turn off. With a purpose to operate the railroad, generate the minimal warmth required and get the highest present capacity, you want to configure the bridge rectifier. Via a diode, the mentioned part turns off the fast MOSFET. 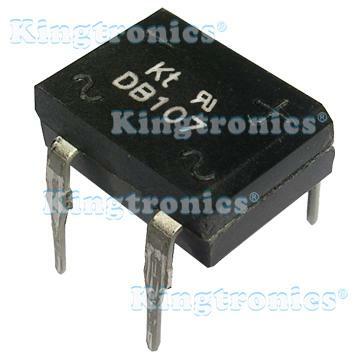 Kingtronics Bridge Rectifiers include: DB101-DB107,DB101S-DB107S,MB2S-MB10S，KBL4005-KBL410,KBU6005-KBU610,KBP2005-KBP210,GBU4005-GBU410,GBJ6005-GBJ610, KBPC25005-KBPC2510,KBPC25005W-KBPC2510W,KBPC35005-KBPC3510,KBPC35005W-KBPC3510W. Since the voltage dropped across a Zener Diode is a known and fixed value, Zener diodes are typically used to regulate the voltage in electric circuits. A Zener Diode is a special kind of diode which permits current to flow in the forward direction as normal. Using a resistor to ensure that the current passing through the Zener diode is at least 5mA (0.005 Amps), the circuit designer knows that the voltage drop across the diode is exactly equal to the Zener voltage of the diode. Kingtronics offer zener diode with good price and quality. Zener diode 1/2W BZV55C2V7-BZV55C47 LL-34 Tape and Reel is one of our most popular part with glass passivated junction and High temperature soldering guaranteed. All parts are with RoHs compliant under kingtronics own brand"KINGTRONICS".